The Cover Images feature uses the BP Theme Compat API to maximize its compatibility with most WordPress themes. It allows members of your community, and groups administrators to upload an image to prettify their headers. A Group’s Cover Image in the TwentySixteen theme. Adding the feature settings to the features property of the Theme Compat theme in use (BP Legacy in most cases: buddypress()->theme_compat->theme->features). You may also want to completely replace the default css styles BuddyPress is using for the Cover Image positioning. In this case using one (or both) of the above filters, you will define a new callback parameter and actually build this callback function so that it’s returning your css rules. The BP Theme Compat API allowes your theme to override the template parts BuddyPress is using to display its content as soon as you put your custom templates inside a subdirectory named ‘buddypress’ or ‘community’ in your theme’s directory. Then you will need to upgrade these template parts according to the changes we have introduced about them since version 2.4.0. In this case, observe the corresponding template parts of the BuddyPress plugin (in the bp-templates/bp-legacy/buddypress directory) and apply the changes to your custom template parts. 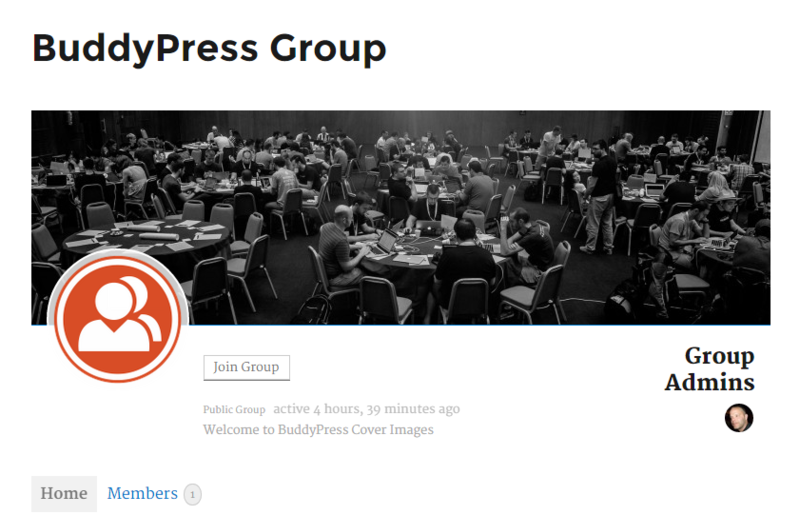 The BP Theme Compat API also allowes your theme to override the BuddyPress stylesheet by putting a buddypress.css file into the css directory of your theme. If you’re doing so, you’ll need to edit your css file according to the css rules we’ve added in the 2.4.0 version. You’ll also need to filter the cover image settings so that the theme handle of your BuddyPress stylesheet is used instead of the BP Legacy one. There is also a great probability you’ll need to use a custom callback function. Here’s an example of the code you could use. These themes are using their very own templates and are generally adding BuddyPress support (add_theme_support( 'buddypress' )) into their functions.php file. In this case, the BP Theme Compat API won’t register dynamically the BuddyPress Cover Images feature. These themes will need to register the feature in order to enjoy it. To show you how this can be achieved, let’s take the case of a well known Standalone BuddyPress theme: “BP Default”. First, you’ll need to make sure your Standalone BuddyPress Theme is following the recommendation of the WordPress Themes Handbook about how to include stylesheets for your theme using the wp_enqueue_style() function. BP Default is following this recommendation and uses ‘bp-default-main’ as the stylesheet handle. Then, you’ll need to register the Cover Images feature. You can choose to register it for Members and / or Groups by including (or not) the corresponding components in your feature’s settings. * chose to register it for both components. // Register the feature for your theme according to the defined settings. An array to inform about the BuddyPress Components IDs you wish to activate the feature for. An integer to set the width of the cover image. An integer to set the height of the cover image. A string to define the callback function that will return your css rules for the cover image. The string used inside the wp_enqueue_style() function to identify the theme’s stylesheet. Now the feature is registered, you will need to create the callback function used to include the css rules specific to the Cover Image feature. In this example, we called it bp_default_cover_image(). NB: if you are enqueueing your stylesheet by hooking ‘wp_enqueue_scripts’ like it is recommended here and if the Cover Images specific css rules are not loaded, you may need to edit the priority of your hook to an earlier one like 9. As we have just seen, the feature is not automatically registered for Standalone BuddyPress themes, so this part should only concern themes using the BP Theme Compat API. If you need some time to “fine-tune” Cover Images for your theme, you can decide to completely deactivate the feature. In this case you can either use filters or stop the BP Theme Compat API from dynamically registering the feature. 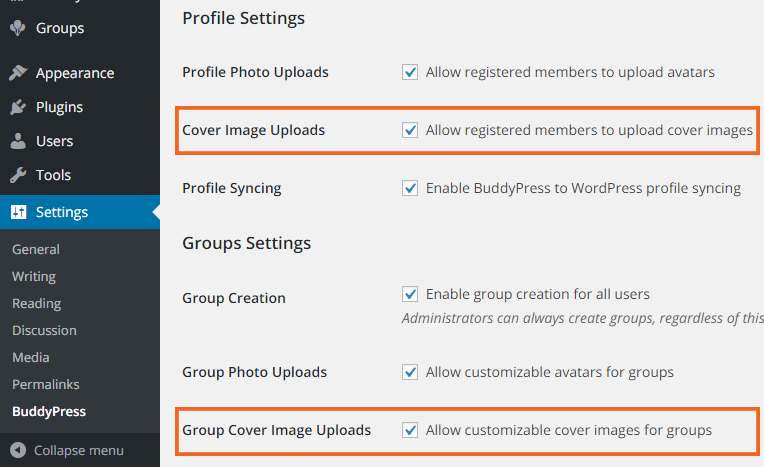 Finally, if the feature is registered, the community Administrators will always have the choice to deactivate the feature from the Settings > BuddyPress > Settings screen of their WordPress Administration.